Which Vehicle will Suit Children? If you are travelling with a baby or with young children you will need to consider the layout of the campervan a bit more carefully. 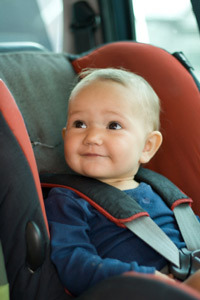 All children must be fastened into a baby seat or booster seat as is appropiate to their age and size. Not all campervans have anchor points for baby seats, and some have setups that may not suit you. What to look for in your campervan? Some campervans have the seating for extra passengers at the front of the campervan, and others have their extra seating at the back of the campervan. If you are travelling with a baby or children, it is always nice to have them seated up front of the campervan close to yourself. You can refer to the Full Vehicle Details and it will outline the Child Restraints that are applicable for each vehicle. If you are travelling with children (that need booster seats) or a baby, we always recommend that you speak to us so that we can check that the booked vehicle will work for you. Alternatively, refer to the baby & child seat requirements page as it gives more detailed information.